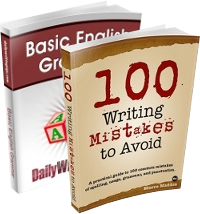 It’s one thing to introduce a spelling or punctuation error when icing a message on a birthday cake or a similar confection — such mistakes are easily disposed of — but when it comes to getting a tattoo, think before you ink, because it’s difficult to render a correction. No, you’re not. Oh, it’s not a misspelling of handsome? It’s supposed to be awesome. No, you’re not. But you would be if you returned to the tattoo artist and — free of charge, of course — had a red caret and a matching e inscribed. 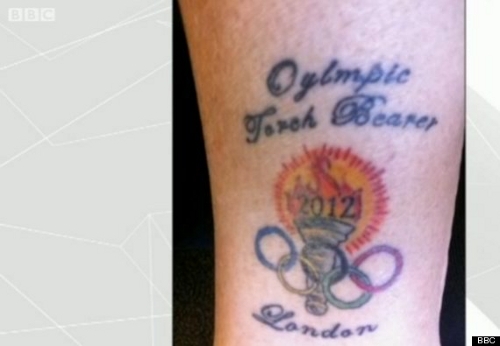 What an honor is must have been for the person bearing this tattoo to be a bearer of the Oylmpic torch — though that’s not as memorable as being a torchbearer for the Olympics. As is probably true in many such cases, she reportedly didn’t know about the error until someone pointed it out to her. Even then, she turned down the tattoo artist’s offer to correct it. She says it’s unique — like she is. Yes, that’s one word for it. 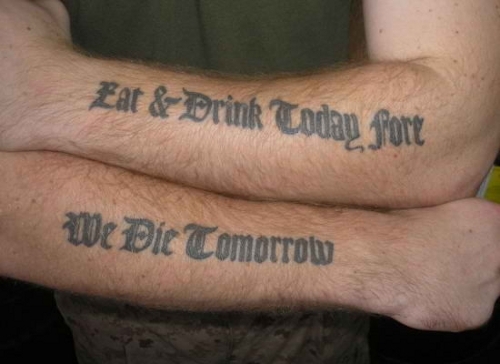 Um, the biblical verse, as usually translated into English, is, “Let us eat and drink, for tomorrow we die” — the statement elegantly terminates with the key word. This fellow’s artistic license in altering the wording and word order is excusable, but the misspelling of fore — not likely a pun on forearm — is not. I would have recommended the standard version, broken after drink — but “broken after drink” is probably the reason for the mistake in the first place. 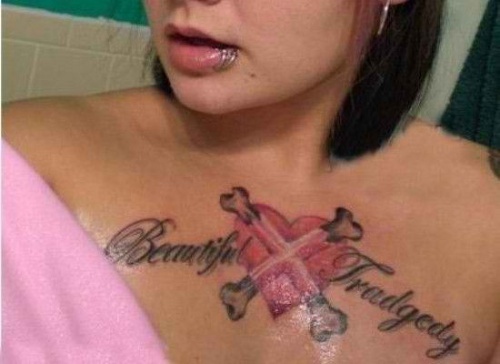 This isn’t the only tragedy tattoo typo one can find (and you might be surprised by how many ways tattoo artists can render regret/regrets), but it’s the most prominent — and therefore the most tragic. More seriously, I would have expected some nagging about the hyphen; would it not be better to have “torch-bearer” or “torchbearer” ? You’re right — I used the correct form of torchbearer in my commentary but neglected to notice and note that the tattoo incorrectly styles the word as an open compound. I guess I was distracted. The worst tattoo booboo I ever saw was “No REGERTS”…I’m betting the woman had at least one regret later. Those tats are terible! Weight, that’s terrible. I ofun confuse the to. Their goin two cost sum reel money two fix. I am always amused by those people who get Chinese character tattoos. They are supposed to read, “Mighty Dragon” or something equally ‘impressive’ – but what if they really mean “No. 13 Beefy Dumpling”? 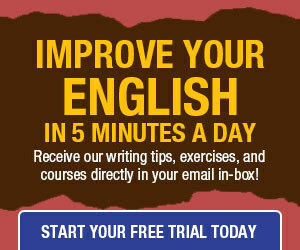 And, yes, that post is grammatically atrocious – call it schoolgirl enthusiasm, rather than teacher’s watchfulness! 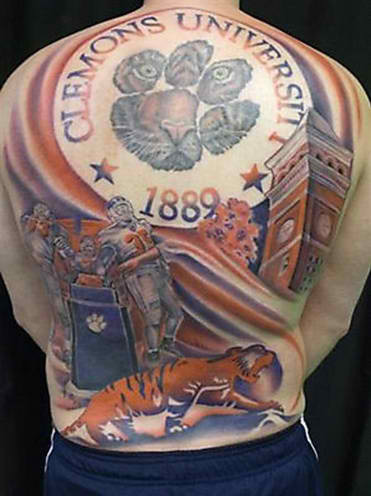 What a crime to do such a beautiful back piece and make such a basic mistake, and because I have connections to the school, I can add that when people talk about Clemson in a derogatory way, they SAY “Clemons.” It just makes it that much worse. I am not a fan of permanent art on one’s skin. That said, I can appreciate the art if not the medium, and this is an astonishing piece in every other way. That tattoo about “Clemons University” is absolutely hilarious. I would think that “Clemson” should be common knowledge. “Gorgetown University”, “John Hopkins University”, the “University of Merryland”. There was an April Fool’s Day joke circulated on the Internet that the Board of Trustees had decided to change the name of Johns Hopkins Univ. to John Hopkins Univ. LOL. There is a Samford University in Birmigham, Alabama, but its name has been misstated as Stanford University countless times. There is a noteworthy Washington University in St. Louis County, Missouri. This one was endlessly confused with the University of Washington (in Seattle), so the Board of Trustees changed the legal name of the eastern one to Washington University of St. Louis — in the hope of making things better. The College of William and Mary in Virginia is as large and varied as most universities, but its charter, which dates back to Colonial times, says the “College of William and Mary”, and its Board of Trustees has never changed this. In reality, it is a state university of the Commonwealth of Virginia. @Sally and Peter: In the early ’80s I read a newspaper article about a fad in China wherein clothing with English lettering was THE hot item of attire. Unfortunately, since many Chinese weren’t familiar with English text unscrupulous merchants were selling t-shirts with such goofiness as “Let’s go young,” or “Throw camel in swimming pool,” and so forth printed on them. Young Chinese people, not knowing they were wearing nonsense, were allegedly snapping up these garments. Jet ahead to 1984 when a similar fad happened in the USA. Americans were buying clothing with Chinese characters printed on it, not knowing what the words actually meant. I was working at a convenience store at the time and had a lot of fun teasing my ‘hip, now, and with-it’ clients that the characters on their shirts, hats, etc. meant things like “dirty bird bath” or “spider in my shorts.” If they asked how I knew this I told them about the ‘let’s go young’ story (above) and how that had inspired me to research the commonly-found phrases on trendy American clothing such as they were wearing. If you get the urge to pull a joke on your tattooed pals you might try a similar gag about their oriental letter tats. Or, if the tattoo is where they can’t see it, act aghast and ask if they knew the word in their flesh was misspelled. A young man finally plucked up courage to show his parents the Chinese character tattoo he’d had done on his bucep. Unfortuneately, he made the reveal at a chinese restauarant. While dining with his sleeves rolled up, he and the family gradually became aware of more and more staff passing their table and moving away with a grin on their face. 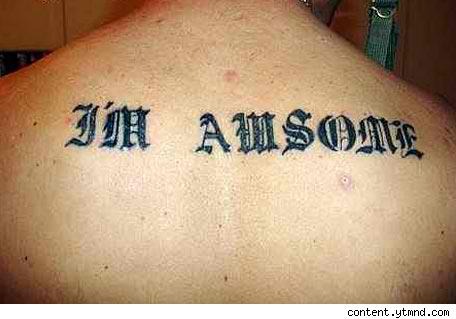 His mother finally decied enough was enough; she asked the next waitress to please translate her son’s tattoo. “At the end of the day, this is still one ugly boy” !! !